Shirts With Random Triangles: Lane Kiffin says the SEC is starting to look like the Pac-12. Lane Kiffin says the SEC is starting to look like the Pac-12. Alabama offensive coordinator Lane Kiffin* has seen the future of the SEC. To him it looks a lot like the conference he used to coach in, the Pac-12. At least when it comes to quarterback play, that is. "In watching a lot of film of their season, (the SEC is) starting to change a little bit toward the Pac-12, spread out with a running quarterback," Kiffin said. "You're seeing that with Texas A&M. The SEC is changing, which is surprising." SEC purists may see not see that as a good thing. Of course SEC purists probably don't see Kiffin as a good thing either. 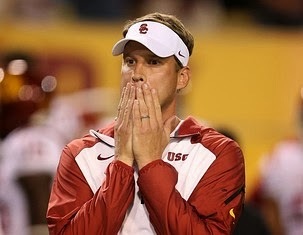 It's too soon to tell how much Alabama's offense in 2014 will resemble a Pac-12 offense like Kiffin ran as head coach of USC. *I will never get used to saying that. It's the most mind boggling thing to happen since Mariah Carey married Nick Cannon.